However MB has a good point. There is great learning potential in losing trades. So in this article, and the next, I'd like to look at a few issues related to losing! We won't look at the analysis for or against a trade today… we'll get to that in followup article. First I want to talk about mindset. The decision to discuss mindset comes about through this comment made by MB in his email, "… in your examples I rarely see you not break even. It's like you have the most amazing ability ever to scratch trades sometimes literally immediately after entering." I can promise you I do have losing trades. True, it's not many. I'll improve that in future. But here's the key thing that you'll notice in looking at any of these losing trades, and that I can confirm as I look over my recent trades to find a loser to share in this article… the losing trades are all relatively boring. There are no large or exciting losses. In all cases, risk is contained and the losses are small. You'll never see a loss greater than 10 ticks (unless it involves slippage on the exit). In any sample of trades I like to see a number of small losses, a number of breakeven trades, a number of small wins, and hopefully one or more outsized wins. NEVER should there be a large loss. 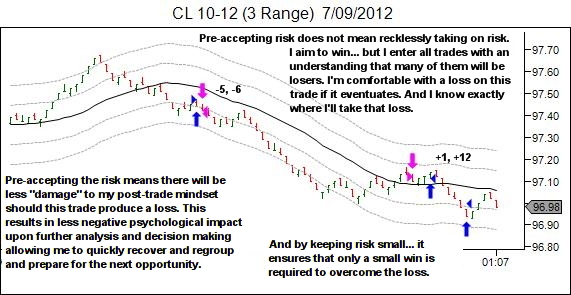 This way, any single loss is easily overcome through one or two winning trades. And even if all your small winners and losers just end up breakeven overall, the large winners will still provide a positive expectancy. At least that's the plan. Keeping losses small though is not just a matter of tight stops. Tight stops will ONLY work when combined with the ability to get back in quickly should the exit turn out to be premature. 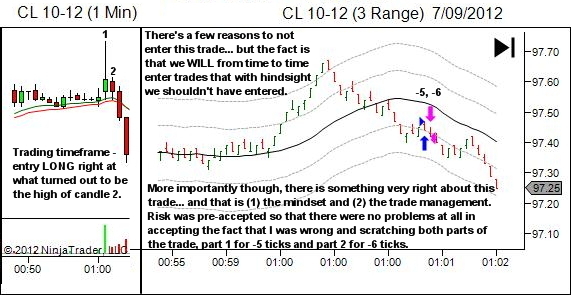 And tight stops will ONLY work if the act of taking that loss does not damage your mindset and negatively impact future analysis and decision making when the next trade opportunity presents itself. I'm not sure of an original source for this concept, but I like the way it's explained by Richard McCall in The Way of the Warrior Trader. Ask yourself before entry, "Am I comfortable with this trade losing?" If you're not comfortable with this then you've likely not yet achieved sufficient confidence in your strategy, or you're trading with too much risk. You will likely hesitate to take the exit, ensuring a greater than necessary loss. And you will likely carry some psychological baggage into the next trade, increasing the chance of poor analysis or decision making and greatly increasing the chance of further losses. Many others have influenced my trading, but my approach to risk could be best attributed to Larry Williams and Mike Reed. I expect every trade to be a losing trade and so will close it out if it can't prove otherwise. Expecting to win is a great way to lose, in my opinion. It leads you to overlook analysis that should raise doubt about a trade's potential. It leads you to hold onto losing trades longer than they should be held. Expecting to lose does not mean quickly scratching a trade as soon as it's entered. I hold the trade. I give it every chance to prove itself. But I know exactly how it should be moving if it is going to prove itself a winner, and if it's not doing that, then I'm outa there! Some trades will be given several price bars. Others will not be trusted at all. As BM noted in his email, in those cases where I appear to have made the decision to scratch almost immediately after entry, it's because my analysis said that if this trade was going to work then it should work immediately. If it doesn't move, I'm outa there! And I'm re-assessing based upon this new information, and looking for the next available opportunity. The end result of a pre-acceptance of risk and an expectation of loss, is the ability to ensure that my account is never shocked by large outsized losses. And in fact many times a normal loss will be scratched prior to the full stop price, for reduced loss. Risk is contained… and a risk-aware but confident mindset is preserved… allowing me to continue to focus on the process of good trading.